These are all small and active butterflies. The blues mostly have blue upperwings although some females and the brown argus are mainly brown. They all have many small spots on their underwings. 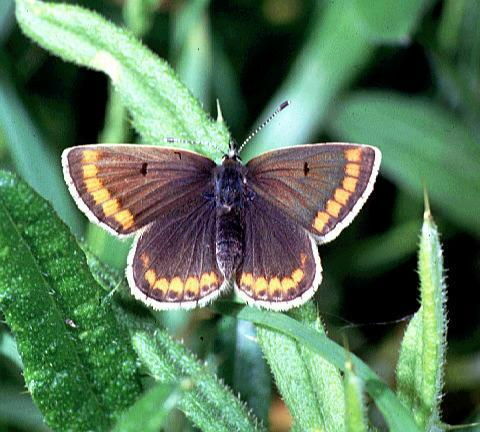 Brown argus and common blue both form discrete colonies in open grassland or heathland. The holly blue is more of a wanderer, laying its eggs on shrubs and preferring the woodland edge. With its strongly marked copper upperwings, the small copper is unmistakable. It can be found in most rough open areas, but usually in small numbers. Hairstreaks are elusive butterflies, living in small colonies mostly on treetops. The green hairstreak is the most widely distributed hairstreak in Britain. It favours warm, sheltered sites with scattered shrubs. The white-letter hairstreak is associated with elm trees but adults spend most of their time in the tree canopy feeding on honeydew. The purple hairstreak also spends most of its time in the treetops, frequenting large oak trees. Although rarely noticed, it probably occurs in most woods in southern Britain with a number of oak trees.